About Cancun: One of the world's most popular and modern vacation destinations, Cancun offers a wide range of accommodations to suit every taste and budgets. And when it comes to activity, you'll never run out of things to do. The crystal-clear turquoise sea is famous for its watersports from fishing to snorkeling and diving. 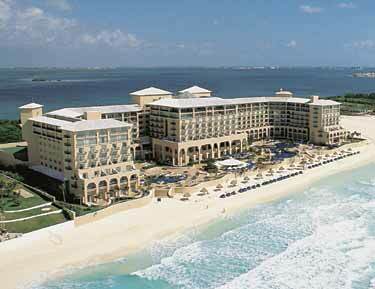 Relax on 14 miles of sugar-white sand beaches that have become the hallmark of Cancun. Bargain abound at local markets and modern malls. The most spectacular archaeological finds in the western hemisphere are all within a three hour drive of Cancun. At night, Cancun comes alive with a huge variety of fine dining options, popular clubs and discos. 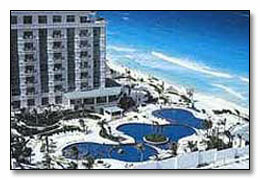 Climate: Cancun was created, in large part, for visitors to enjoy almost perfect year-round weather. Thanks to the cooling influence of winds off the sea, temperatures never fluctuate much form the 80°F (27°C) range, and the sun shines every day for more than two-thirds of the year. However, those planning to visit inland areas such as the Maya ruins at Chichin Itza should be prepared for much more sultry conditions. Only rarely does Cancun experience temperatures below 60°F (16°C). Rainfall is sporadic, more during the late summer months, and averages just 41 in/104 cm a year. Documents: All visitors to Mexico are issued a tourist card upon entering the country. You must have a passport or birth certificate along with a photo I.D. to prove your nationality; a driver's license alone will not suffice. Guard your tourist card carefully, as it can be very hard to replace and needs to be presented upon departure. Special requirements. Currency: New Peso is the official currency, U.S. dollars are accepted almost everywhere, although change is frequently returned in Peso. The exchange rate is US$1 = NP 8.3. Electricity: 120 volts/60 AC; U.S. appliances are compatible. Taxes and Tipping: The departure tax is US$12 collected at Cancun International Airport. Room tax is 10 percent, and 15 percent service charges are usually added to bills. Service personnel should be tipped according to level of service provided; 10 - 15 percent is the mean for taxi drivers, waiters, bellhops and bartenders. 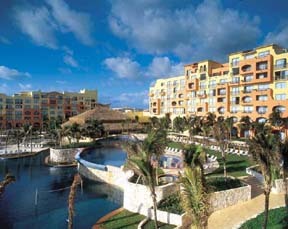 Languages: Spanish is the official language of Mexico, but in the hotel zone of Cancun, English is spoken everywhere. One will also hear French and German due to the international tourist.